Why use this coloring book? For more than 35 years, The Anatomy Coloring Book has been the #1 best-selling human anatomy coloring book A useful tool for anyone with an interest in learning anatomical structures, this concisely written text features precise, extraordinary hand-drawn figures that were crafted especially for easy coloring and interactive study. Organized according to body systems, each of the 162 two-page spreads featured in this book includes an ingenious color-key system where anatomical terminology is linked to detailed illustrations of the structures of the body. When you color to learn with The Anatomy Coloring Book, you make visual associations with key terminology, and assimilate information while engaging in kinesthetic learning. 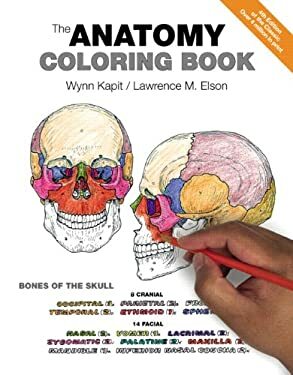 Studying anatomy is made easy and fun The Fourth Edition features user-friendly two-page spreads with enlarged art, clearer, more concise text descriptions, and new boldface headings that make this classic coloring book accessible to a wider range of learners.